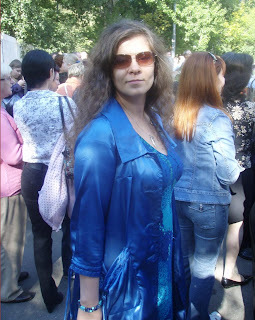 Anhar Kochneva, a prominent Ukrainian career journalist was kidnapped near Al Qusayr city in Homs countryside, Syria on October 12, 2012. A group of fanatic Al Qaeda Jihadists declared they have kidnapped her for a hefty ransom of US$ 50 million. They’re supported by western nations under the guise of FSA or Free Syria Army with the goal of ‘democratizing’ Syria, the US way like in Libya or Afghanistan or even Iraq. the sole representatives of the Syrian people in the eyes of the US administration. Al Qaeda FSA terrorists issued a statement giving today, Thursday, December 13, as the final deadline or they’ll execute the kidnapped journalist Anhar Kochneva if they don’t receive the money. Similar kidnappings have taken place by the same group under the supervision of Turkish prime minister Erdogan to exercise pressure on Iran, Syria and Hizbollah to secure Israel’s protection. She is a prominent journalist with a Ukraine passport known to be very active by the entire Syrian population for about 2 years, that makes her a prominent Ukrainian journalist. And if she wasn't important they wouldn't ask for $50 million ransom for her. In Ukraine is she a nobody. She was born in the Soviet Odessa (now Ukraine) so has ukrainian passport. In 16 years left she her mother and moved to Moscow. She also has a Russian passport to.In Ukraine, her remembers only the old mother.